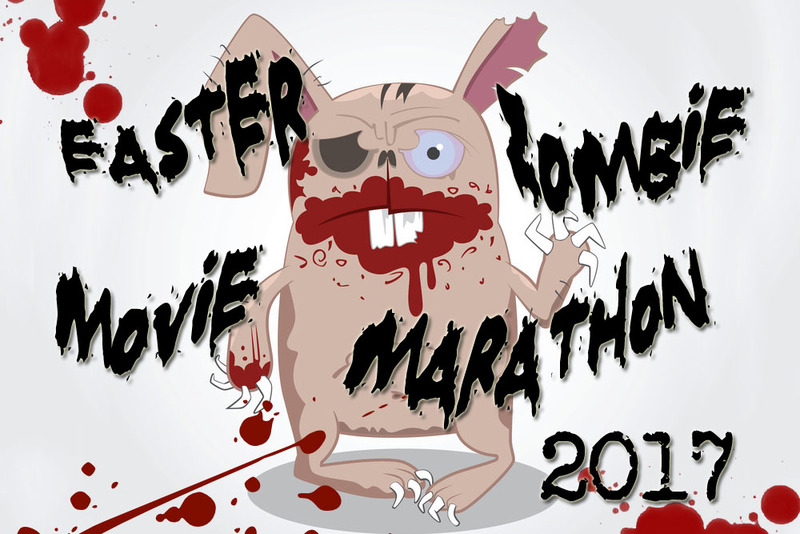 Day two of our Easter Zombie Movie Marathon takes us to the year 2007, with two very middle-of-the-pack type of zombie films: The Mad – where Billy Zane fights Mad Cow People – and Flight of the Living Dead – where zombies attack a plane in flight. Both films have their plusses and minuses, but overall, while Flight is a more “serious” approach to the genre, The Mad has enough wit and personality to make it the clear winner tonight. If we were picking winners, that is. The Mad is a Canadian production, directed by John Kalangis and written by Kalangis, Kevin Hennelly, and Christopher Warre Smets. Kalangis is an actor who has transitioned entirely into directing around 2005 with a documentary about Doctor Who (?!? ), with The Mad being his fourth feature overall, and I have to admit, if Billy Zane weren’t in this, I probably wouldn’t have given it the time of day. It doesn’t make it fun. A bad movie is a bad movie, and while there are those people who get a kick out of mocking and making fun of bad movies, we try not to do that here at PDI. We want to find the sincere attempts to make something creative, to work with shortcomings, and to find the heart and soul of low-budget, indie horror. For a while, I thought that The Mad was going to be a waste of time. But there was Billy Zane. Zane is one of those actors who is always interesting to watch, no matter what the role. Personally, I became a lifelong fan after his turn as The Collector in Tales from the Crypt: Demon Knight, and depending on when you ask me, I might be a fan of The Phantom. This time, he’s playing an ex-musician/current doctor on a vacation with his new girlfriend, his daughter, and his daughter’s new boyfriend. He’s distracted and mumbly, almost always taking a few seconds longer to act or react than you would expect, and it’s hilariously mesmerizing. The father-daughter relationship is the core of the film, and everyone else is expendable, so we’re given quite a few entertaining kills from both the zombies and the humans. Or the Mad Cow People, rather. My favorite moment in the film is where the characters actually debate whether or not the monsters attacking them are zombies or simply the infected. It’s the sort of self-aware comedy that almost doesn’t work, but Zane centers the scene and everyone nails their moments. If you want to spend ninety minutes just have a good laugh, The Mad isn’t the worst way you could spend your time. 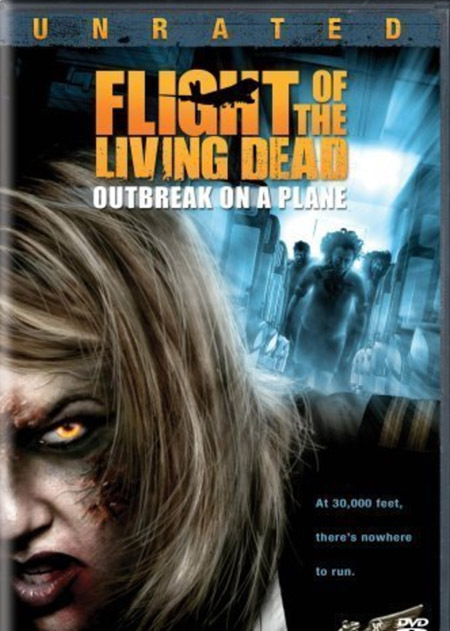 Flight of the Living Dead, on the other hand, has way more negative going for it. 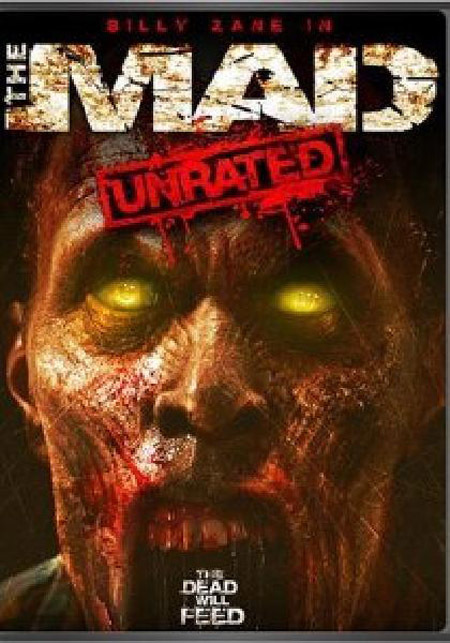 The main problem with the film isn’t the zombies, but the core weakness of all straight-up, traditional zombie films: establishing the characters and the potential threat. While it’s only just under twenty minutes before the zombie chaos breaks loose, those twenty minutes feel like an eternity. The characters are all cardboard cut-outs, any dramatic tension is so artificial and forced that it’s painful to watch, and worst of all, it’s just dreadfully boring. The novelty of making a zombie movie onboard a passenger jet in flight is totally lost when it really just means that our characters all stay in or around their seats when they’re not slipping off to the toilet. I’ll be honest. If I hadn’t just double-checked to make sure it was about eighteen minutes before the first bloodshed, I would have guessed it was around a half-hour to forty minutes. It’s really that slow. Too many characters are introduced to give anyone enough time to become fully fleshed out and we’re never really sure which of the dozen or so characters are even our main protagonists. On the plus side, however, once the zombie outbreak kicks in, it’s non-stop blood and gore and not a horrible experience after all, if that’s what you’re looking for. But it’s really just an effective shock distribution device more than it is a film. None of the characters are interesting, although Kevin J. O’Connor does his damnedest to liven up his oddly non-specific criminal character. What exactly did he do and where exactly is he being taken handcuffed to a cop? That’s really not important to this story, so instead of allowing his character to really be a potential threat to the others onboard, he’s a campy cartoon who becomes the comic-relief part of the team when it’s all said and done. Erick Avari is suitably conceited and self-obsessed as the chaotic evil Dr. Bennett, the man behind the experiment that causes all the ruckus in the first place. He’s also a suitably threatening and disturbing zombie when he finally turns. Ultimately, though, Flight of the Living Dead is on auto-pilot, lacking enough character work to make us care about anybody on the plane. And while the zombies are nicely done and the violence is more practical effects work than CG, the film becomes an exercise in futility. There are no larger themes to be explored. There are no characters worth taking an interest in. There’s not even an ironic twist tossed in at the end. There’s just a bunch of blood and gore in an airplane setting that really doesn’t get used to its full potential.